When it eventually arrived (took less than 1 week) my first thought was that the design and feel gave me a nostalgic reminder of my old pair of Fidelio X2 headphones which are way more expensive and more technically advanced. Regardless though that was a good start. Next, when actually plugging the things in and loading up PubG I was able to get a better grasp on things like comfort and sound quality. Here are in my opinion the Pros and Cons of the Plantronics 600 headset. This was probably my favorite feature and something that sets this headset apart from other gaming headsets. Very quickly you can remove the microphone and turn it into what looks like a standard headphone which I thought was really cool. When the microphone is actually attached, I found that it picked up my voice really well and that is the noise cancelling feature was one of the reasons for that. Clearly aside from the sound, the next best feature is the comfort, and a lot of companies are starting to innovate in this space. After playing PubG for about 3 – 4 hours straight in a hot environment wearing this headset almost non stop I was very grateful for the breathable materials that made it feel fresh and light. This will be a useful feature for the fat sweaty gamers out there. The cushioned over-ear cups were, and the headband wasn’t loose but by no means too tight. 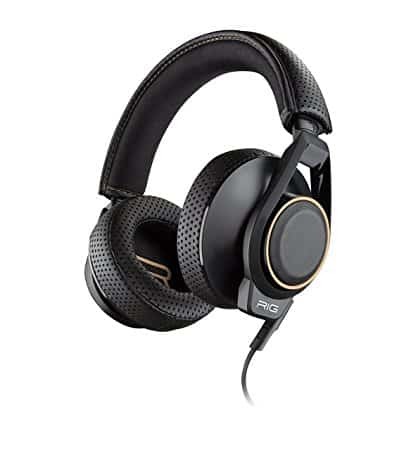 There is a reason I have put this headset in my best headsets under $100 guide and that is because I really feel like the Plantronics 600 is one of the best currently on the market out there for gamers looking to save some money. Yes, you could get something way cheaper, but for this price, you get what feels like a very high-quality headset. There are some reports out there of the cords breaking, but if you take good care of your headset, then it’s going to take care of your gaming needs for a long time. There isn’t a whole lot wrong with this headset then I would say the audio is good but not great. Do not buy this gaming headset for music needs as it just won’t do a good enough job. Also when using this headset on only the Xbox, I found the audio quality went down a notch which is a problem I never run into with my other gaming headsets which is strange.